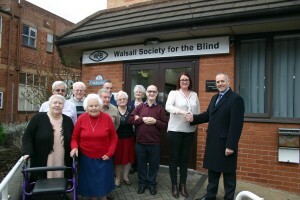 Walsall Society for the Blind are proud to have been chosen by Enoch Evans LLP as their Charity for 2018. This is indeed an honour for WSB and we would like to say thank you to Enoch Evans for choosing us and for their support of the charity and the work that we do for the visually impaired in our community and in the Walsall Borough. If you, or someone you know has deteriorating vision or sight loss and would like information, support or if you have any concerns, please do get in touch with us, we are always happy to help.